When it comes to their fiduciary duties, constituent-appointed board members struggle with the Duty of Loyalty. Most come with the understanding that they are supposed to “represent” the chapter or association that appointed them to the national board. I blogged on this topic last September. It came to mind after I worked with new directors of a national association and followed the board’s corporate counsel outlining the fiduciary responsibilities of the board members. Since all were appointed to the board by a state association, they too struggled with the conflict between the national organization and their state association. If your association’s board is composed of directors appointed by a constituent organization, they too are likely to face this struggle. 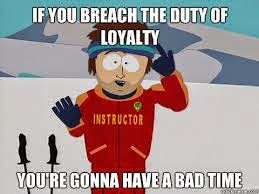 In this case, it is important to include discussions of the Duty of Loyalty in annual orientation sessions. I find it helpful to have your outside legal counsel make this presentation. What do you do to educate your board members on the Duty of Loyalty? Can Your Association Act Fast Enough?